Fate has a funny way of producing amazing success out of apparent failure. For the best part of two years, director Lynne Ramsay struggled to bring The Lovely Bones to the silver screen. She relinquished the project in 2004 and contemplated giving up filmmaking, while The Lovely Bones eventually emerged in a heavily flawed version helmed by Peter Jackson. But without being unfair to either director, this failure was almost certainly a good thing. Otherwise, we wouldn't need to talk about Kevin. We Need To Talk About Kevin is Ramsay's first film in nearly nine years, and is without any conceivable doubt the best film of the year. It's an astonishing, bold and haunting work which is both evocative and emotionally draining, combining a fragmented, nightmarish narrative with expressionistic visuals to create an intoxicating experience. Its unique and frightening vision of the world will chill you to the bone and remain with you for a very, very long time. Regardless of its other merits (and there are many), the film is a flawless adaptation of Lionel Shriver's novel. Ramsay doesn't fall into the trap of many bestseller adaptations, which simply arrange the pages in a literalistic order, shoot what they contain and hope that the performances will somehow hold it together. Instead she takes the book's fragmented confessional structure and transforms it, allowing the story to move between events fifteen years apart without any feeling of directorial imposition or incoherence. 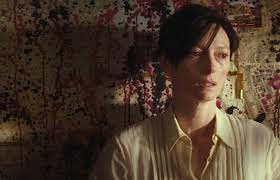 We Need To Talk About Kevin finds Eva Khatchadourian (Tilda Swinton at her terrifying best) looking back over her relationship with her first-born son, struggling to understand how and why he ended up massacring his classmates with a bow and arrow. Their story is told expressionistically, with imagery, colours and sounds being employed to connect Eva's memories. We are never spoon-fed any easy answers about where blame or cause may lie, or whether Eva's intense guilt is justified. The experience is draining in the best possible sense: we follow every glance and sound intensely, feverishly looking for some kind of meaning in all the horror we encounter. Purely on a narrative level, We Need to Talk About Kevin is an extraordinary representation of how memory works. It is on a par with Memento in its refusal to allow plot to get in the way of story, or mechanics to override emotions. The internal logic of Kevin is present in its powerful colour palette: the film begins with Eva being drenched in tomatoes at La Tomatina in Spain, which foreshadows the gruesome massacre that Kevin will wreak upon his innocent and unsuspecting classmates. But like Christopher Nolan's later works, like Inception and The Prestige, feeling lost or deeply confused is as thrilling as having it all worked out. Outside of Nolan's mental and narrative acrobatics, the film to which Kevin sits closest is Inland Empire, David Lynch's most recent and perhaps most esoteric work. Both films feature female protagonists who are dragged deeper and deeper into a dark world from which there is seemingly no escape, and in which the power of their imaginations are as great an enemy as whatever physical evil may be waiting for them. Eva's guilt, shame, negligence and suppressed despair are a powerful cocktail which produce moments of both earth-shattering horror and painful beauty. The other comparison between Ramsay and Lynch is in the disorientating use of sound. The soundtrack to Kevin is by Johnny Greenwood, who previously scored There Will Be Blood, and here he continues his fascination with the intrusive quality of music. Where There Will Be Blood featured burbling eruptions and groaning ironwork (akin to Alan Splet's work on Eraserhead), Kevin is populated with background noises being amplified in a way which is fantastically unsettling. The film's exploration of memory and trauma is not confined to the evocative nature of colour and composition. Ramsay's sound design is magnificent, turning ordinary background noise into a source of threat and menace. Kevin's constant screaming as a young child leaves Eva and us with a heightened sense of the world around us. We hear a lawnmower, or a sanding tool, or even rain falling, as if there were a woodpecker hammering away in each ear. 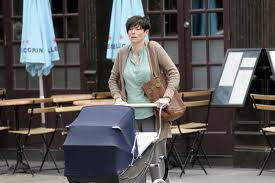 In one memorable moment, Eva parks Kevin's pram by a pneumatic drill in the road, going to desperate lengths to drown out her child's complaining. We are on constant alert throughout the film, and every sound, especially from Kevin, feels like a vicious attack. 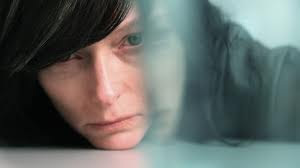 But as well as being aware of such attacks, Eva appears to have grown numb because of them: it's difficult to say whether she simply no longer cares about what Kevin does, or whether she is too tired to fight. Perhaps she invites in the noise of the world around her to help her forget the problem she has borne. The film is an intelligent, nuanced and multi-layered approach to the nature of evil, asking many questions to which there are no satisfying answers. It's redundant to single any one out as the 'issue' of the film, because they are all interconnected and there is no sugary pay-off that you would find in more Oscar-baiting work. The film is almost structured as a thriller, in which we are charged with gathering all the evidence and offering our verdict as to what happened and why. But the evidence is so conflicted, ambiguous and speculative that it will take many viewings and much discussion to settle on even a workable version of events and motives. One of the questions which Kevin raises is whether evil is something which is innate, or whether it is a product of one's upbringing. Eva is far from a natural mother, seemingly incapable of dealing with Kevin and harbouring bitterness at him for ruining her life and career. But both of the actors who play Kevin (Jasper Newell and Ezra Miller) have a disturbing charisma and intelligence: they are smarter than Eva and Franklin, seeing through their every word and deed, and having no time for emotions unless they serve their interests. From this arises the question of who is to blame for everything. Is Kevin guilty because he is inherently evil, a sociopath who exists to provide entertainment for the empty-headed morons that are called his equals? Is it Eva, for not standing up to him? Is it Franklin for ignoring Eva's warnings, laughing off her perhaps irrational ravings with comments like "that's just what boys do"? Or perhaps it is a wider social problem: Kevin speaks about the voyeuristic nature of modern society, in which people on TV are filmed watching TV, and in which what is left of entertainment comes from acts of shocking, shattering horror like those that he will perpetrate. Finally, there is the role of emotions to consider. It is possible to accept, up to a point, that Eva never really loved Kevin: that she held him responsible for ruining her chances of happiness, and soon got tired of playing mother, knowing full well that there was no point. But equally there is evidence of Kevin's emotional side underneath his dark veneer. We might accept that he is a sociopath, someone who cannot process human emotion and revels in causing pain to others. But in the final scene in the prison, he is openly afraid, a sign that he is still a child who craves affection. This is a significant if pyrrhic victory for Eva in a story of shame and sorrow, and the ending with her walking into piercing white light would seem to leave things on a balance between optimism and stark pathos. 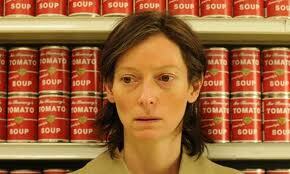 We Need To Talk About Kevin is the film of the year and Lynne Ramsay's best work to date. It is a shocking, haunting, deeply unnerving masterpiece with a bold artistic vision, every bit as striking and earth-shattering as the best works of David Lynch. If we get another film as good as this in the decade, let alone the year, all the dross which passes in between can easily be forgiven. It is a staggering achievement on all fronts, and nothing short of essential viewing. Totally agree. I have to ask are you a clone of Mark Kermode? You're opinions are very similar. Amazing film, one of years best. I've wrote my own review. Check it when you have the time.